Athletics is a collection of sporting events that involve competitive running, jumping, throwing, and walking. The most common types of athletics competitions are track and field, road running, cross country running, and walking race. The Cotswold Olimpick Games, a sports festival which emerged in 17th century England, featured athletics in the form of sledgehammer throwing contests. Annually, from 1796 to 1798, L'Olympiade de la République was held in revolutionary France, and is an early forerunner to the Modern Summer Olympic Games. The premier event of this competition was a running event, but various ancient Greek disciplines were also on display. The 1796 Olympiade marked the introduction of the metric system into the sport. 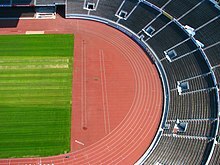 The Amateur Athletic Association (AAA) was established in England on 1880 as the first national body for the sport of athletics and began holding its own annual athletics competition – the AAA Championships. The United States also began holding an annual national competition – the USA Outdoor Track and Field Championships – first held in 1876 by the New York Athletic Club. 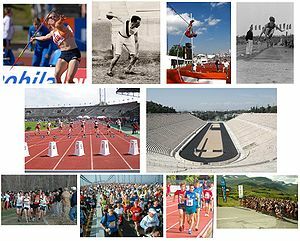 Athletics became codified and standardized via the English AAA and other general sports organisations in the late 19th century, such as the Amateur Athletic Union (founded in the US in 1888) and the Union des sociétés françaises de sports athlétiques (founded in France in 1889). Masters athletics, the age groups spanning five years for athletes aged 35 and above. Occasionally, athletes with a disability excel to compete with able bodied athletes. Legally blind Marla Runyan ran in the 2000 and 2004 Olympics and won a gold medal in the 1500 metres at the 1999 Pan American Games. Oscar Pistorius, a double amputee, has competed in the 2012 Olympics. At the 2011 World Championships Pistorius successfully made it to the 400 metres semi-final round and won a silver medal as part of South Africa's 4x400 metres relay team. In Masters athletics it is far more common to make an accommodation for athletes with a disability. Blind Ivy Granstrom set numerous Masters world records while being guided around the track.